Most of the time I don’t get too excited about something new that I’m trying until all is said and done at the end of the season. Breen lettuce, (one of the new varieties I’m trying this year) is definitely an exception. As with most romaines. Breen is said to have firm crisp leaves with excellent flavor. From what I’ve seen of Breen seedlings I think the leaves are going to be the same texture as Sierra Batavia – one of my favorites. The leaves are almost succulent and absolutely delicious. Pictures on the internet of Breen show various colors from deep red to red with green closer to the base of the leaf; so I’m not sure if mine will change as they grow. I love the color just as it is on the seedlings – olive green with an overlay of dusty red. 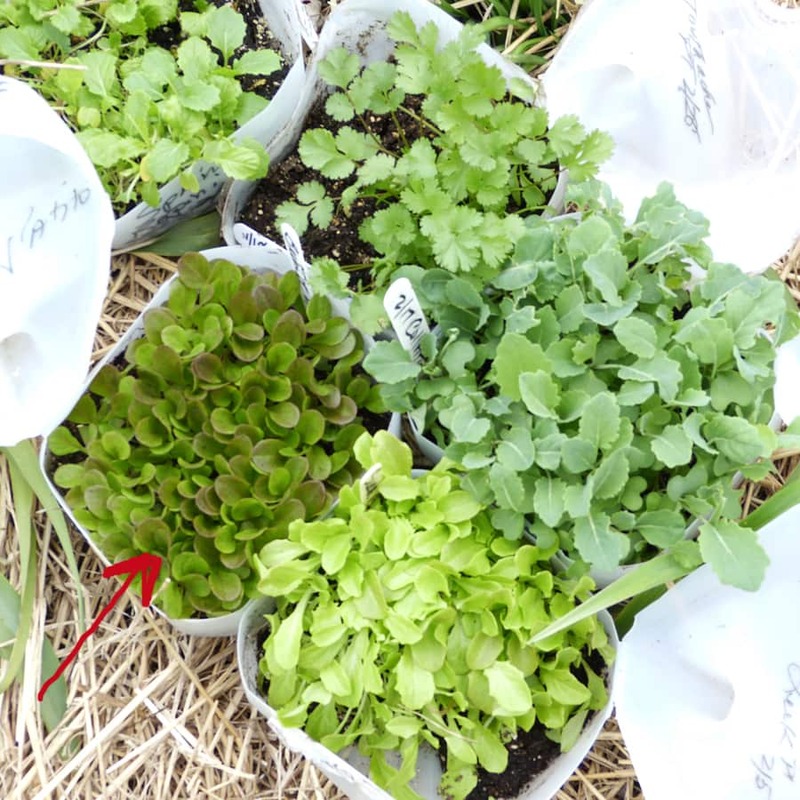 The red arrow is pointing to the Breen lettuce seedlings. I started transplanting a week ago and finished up today in anticipation of the rain Friday. Usually when I transplant lettuce seedlings, they’ll take a while to establish themselves and stand up firm and straight. The Breen seedlings I put in last week, looked perfect even the very next day. Sometimes I tend to plant too many seeds in one container. If time slips away on me before I get to transplant them, those little lettuce roots get long and twisted together and not all of those seedlings can be pulled apart. Surprisingly, Breen is not like that and was relatively easy to separate. Since we’re talking lettuce, if you’ve never tried a dressing that I think is one of the most versatile, why not plan to give it try this year. Check it out here. Hope you’re growing something new this season. If you have some space — why not order some Breen lettuce. From what I’ve seen so far, it might be destined to be one of my favorites – and possibly one of yours. You are my go to blog for everything gardening! Thank you for your wisdom & expertise! always appreciate the information…I love lettuce and am always searching for a new variety and I do try new types, but unfortunately they never come with a solid recommendation like yours! I’ll be anxious to add it to my list and see how it performs. Unrelated, but have you had any experience with leeks? Specifically large varieties good in Northern zone 5 conditions? It’s been a while since I’ve written or read the posts but it’s time to get back to it. We grew turnip greens over the “winter” and had lots of radishes till we had a freeze. No problem, I found a good recipe for roasting radishes (new concept to me!) and liked it very well. I banged The romaine that had gone to seed on the ground and hoped they would germinate. Thought they failed but lo and behold, I have several clusters of small romaine growing in the garden plot and a couple in the grass nearby. No matter, they will be fine as I pull the grass away from them. Like you, I have a couple of close clumps of lettuce that are growing more slowly. Is there a way to separate them without hurting them? I’m loking forward to doing more in my garden and hope I have the energy and motivation to keep going. Oh, my asparagus (grown by the previous owner of our house) is coming up amazingly. How do I Treat the OLD stalks that we cut down (maybe not low enough) in the fall? Do I pull them out, just leave them, or try to cut them down more closely to the ground? I appreciate your telling me Kathy! And you are welcome! Jim, be sure to try Sierra Batavia as well. Excellent lettuce and I think you’ll really enjoy it. Also I know you do a lot of soups. You remember Lisa from the garlic post? Well she does wonderful soups. Has a bean soup with escarole lettuce in it. Thus — in late August or September why not start some Cornetto Di Bordeaux Escarole? This variety is a French Heirloom that is noted as one of the best. About leeks. I’ve planted them previously. I planted them in a far corner of the garden and always ended up forgetting about them, so – NO — I can’t tell you much about leeks. Hopefully another reader will join the conversation and give you more information. Susan, glad you’re reading again. Nice to have you back. Regarding your lettuce, just take a handful of the clump and gently work at pulling them apart. It’s normal to lose a few. Toni,(comment below) thanks for letting me know something was wrong. When I answered comments I didn’t notice that Don (and you) was really commenting on the post about the dressing and I answered there in error. I removed the answers and put them here. Also put your comment here as well. Regarding the dressing I use honey. (I haven’t used sugar in about 40 years.) I use olive oil as my oil. It is so good to see another post Theresa – I have been missing you. 1. Why can’t I see the people’s posts that you replied to above? 2. Did you use sugar or honey when you made your dressing? 3. What is your preferred oil to use in this recipe? I am looking forward to trying both the Breen lettuce and the dressing. Nice that you remembered about the soups…last season I actually made lettuce soup (you can find any recipe on the internet) and the 3-XXL bags of lettuce I had cooked down to a manageable amount (like spinach cooks down)and I made 6-gals to freeze. I was worried some of the lettuce would be bitter as it had gotten away from me (lots of it), but the final flavor was mild and smooth (think immersion blender). Of course you had to like the taste of lettuce, after all that’s what 50% of the ingredients were, but adding chix broth and a few vegs…voila! Nice way to use excess produce. I’ll make sure to try those romaine varieties you suggest. Also a comment about Dixondale Farms and their onions….since you recommended them I have been purchasing my transplant onions from them for several years now and they are always superior size and quality! Thanks for sharing!!! Where can I buy Breen seed? I’ve grown leeks every year for the last six years, I love them. I’m in zone 6…although for the past 2 Winters we’ve had zone 5 weather! If Jim has any particular questions I’m happy to see if I can answer them. Thanks Jen. I’ll email Jim and let him know of your offer to answer questions. So nice of you! thanks so much for the offer to help concerning leeks…like you, I too have grown leeks previously but need help with technique. First, are there any specific varieties you grow for your zone…Ones that might perform better for you? Also, how do you plant them…assuming you use the transplants, do you insert them “completely” down in the soil at planting, or do you trench the area and gradually build up the soil as the leek grows to cover them? My leeks have not really grown to large diameter size and I’m wondering why. They receive full sun and are not planted too close together. My soil is productive and loaded with nutrients. Have you ever tried blanching the stem further with a cardboard paper towel roll, for example? Again, really appreciate your willingness to help and so nice of you to offer! Hi Jim! And thanks, Theresa, for facilitating this discussion. I like Musselburgh for my go-to variety up here. I have planted others, like Arkansas, American Flag, etc., but I don’t really need slender leeks in Summer, or even at the end of Summer. To me, leeks are a Winter vegetable, so I want great fat leeks in late Fall through early Spring. Your preferences may surely vary. But Musselburgh is my favorite for performance in that regard. I have tried the ‘poke a hole and drop the seedling in’ method of planting leeks deeply, but they seem to never really fatten up that way for me. Long white shanks, yes, but skinny. Not enough light, maybe? I don’t know. Some really famous people recommend it, and it’s sure easy, but again, it doesn’t work for me. I sow my seeds in late Winter, either indoors in flats or ‘wintersown’ in covered containers outside. Both ways work fine. When the seedlings are at least the thickness of a pencil lead (1/8″ or so), I use a pointed hoe to make a trench down the row, about four or five inches deep if I can. I set my plants a few inches apart in the trench and throw a scanty inch of leaf compost over the roots and water them in. In a few days when they look stronger, I stand up the leaners and start adding more compost over the roots. Then as they grow and thicken up I gradually fill in the trench over the season. I always water before and after adding more soil over the roots. Toward late Summer they get gradually hilled up further with leaf mold, hay, soil, or what-have-you. I have never tried the cardboard roll thing. However this year I’m going to hill up some portion of my crop with just spoiled hay, and see what happens. First…Thank You so much for answering and sharing (in depth) your technique & experience with this. So I read your response several times and I’m smiling because some of your comments sound just like me….”I don’t need slender leeks in Summer, I want big fat leeks in Fall” (that’s what I think, they’re a late season crop when most of the garden is bare, my fat leeks are calling) ! Interesting you mentioned Musselburgh…I have planted Lancelot for several years and get medium-fat results. I do push the spacing and tend to plant closer than might be “recommended” (I plant like 3″ apart), but many of my plants are too slender for my liking. I personally don’t think its spacing or light or my soil. I recently purchased a seed packet of Musselburgh while researching better varieties for my zone 5 (Northern Illinois) climate and am hopeful things change with these, but this won’t happen until next year as I have already purchased my leek transplants for this season. I have also tried the dibbler method of dropping the leek in the deep hole, and as you say, it is super easy and I like it for that, but can’t say I’m sold either on the final results. The trench method is another technique I’ve tried but frankly it seemed more work and fussing for the same skinny results. This has also made me wonder if I’m working with the optimum variety for my climate? This year I’m moving my leeks to another raised bed…like you said, who knows and maybe they’ll be happier somewhere else. I so wish I had a place where I could start my own seeds! I’ve been trying to convince the Mrs to (temp) convert a spare bdrm into a grow room…but that ain’t happening! That’s also why I buy the transplants to get a jump on things. The ones sent from Dixondale (as mentioned in Theresa’s TMG) arrive nearly 1/4″ thick like the diameter of a pencil. Jen if you had to guess, how large on average would you say your leeks get at full grown? I bet the hilled up hay will work…just need something to keep the light off right? My dad would wrap and fasten a length of tar-paper around a bunch of celery to blanch it and it worked fine…did the same with cauliflower. I’m going to try the paper roll thing on a few and see what happens. Finally…thanks Theresa for coordinating this connection, you’re the best! I sure enjoyed the conversation Jen and Jim! Jim, I wanted to add a couple of things. I did want to emphasize that you don’t need to have a place inside set up to house seeds and seedlings. Especially if you’re starting your winter leeks from seed in this season. You are such and experienced gardener and you’d do great from seed!! Just my 2 cents worth. Couldn’t resist. Thanks to you both for a great discussion! Ah, well Theresa, in zone 5&6, this particular Winter did kill many wintersown seedlings. It was unseasonably warm in February, followed by unseasonably bitter cold in March. Things sprouted that one month, and then were utterly laid to waste the next, inside their little ‘protected’ containers. I’m sad to say that no little plastic lid protects a forest of lettuce seedlings from sudden single-digit temps overnight. Very sad to say. I had the instinct to rescue some of my containers, but out of a sense of experimentation I let others brave the cold (and they did die). The mavens of wintersowing says to let it all hang out, but in my unfortunately VERY recent experience, when a 6-degree fahrenheit evening is in the forecast, and your veggie babes are up in their little nurseries, take them into shelter for the night. Because they won’t survive that. 20 degrees, sure, maybe. Not 6. Jim, my very fattest leeks get to be about 2 inches thick, with the majority between 1- to 1 1/2 inches thick. OK Jim, I never really researched this before, but maybe go on youtube and enter a search for The Giant Leek Project. It’s a series of videos, and you will (apparently) learn how to make giants. Jen — just for record “my” method of starting seedlings is not really “wintersown” as the “wintersown” mavens promote. And I would never begin to think that young onions seedlings (or leeks) would make it through severe temperatures. They won’t. My way of starting seedlings uses more common sense than that. I discovered all my methods by doing. I don’t have any place to set up grow lights and all that kind of stuff. And yet, I start all my plants successfully from seed. thanks for the heads-up on The Giant Leek Project…who knew! I need to think more about youtube I guess when researching stuff! I watched it and noted the specific variety. If Lancelot is by nature a thinner leek, that would answer my issue. Like I said, I already purchased this seasons transplants and just planted them yesterday…all 150 of them! Live and learn…gardening is a never-ending learning process, glad I found TMG to help along the journey.